In 2013, Washington-Centerville Public Library set the wheels in motion for a future Woodbourne Library Expansion Project by purchasing the McDonald’s property, located at 6004 Far Hills Avenue (including the current Library Cataloging Center and Woodbourne Library). The three properties were ultimately unified as one library campus aimed at unpacking the collections, services, and programs at Woodbourne Library, as well as increasing parking capacity and improving traffic flow. Photos of progress on the property, related events, and other artworks added to the permanent collection can be seen here. In August 2018 Blueprint was permanently installed at the Washington-Centerville Public Library. The installation of this project was made possible with the assistance of LWC Architects and Martin Pleiss, Exhibition Designer/Chief Preparator at the Dayton Art Institute. This acquisition was generously funded by the Dorothy R. Yeck Endowment for the Arts at Woodbourne Library. It is among three other works selected for the Art Speaks Volumes collection by artists Amy Kollar Anderson, Ronald Geibert, and David Corns. Abstractions throughout the piece are derived from blueprint drawings provided by LWC Architects and the original Woodie Garber blueprints that were digitized by the University of Cincinnati Archives and Rare Books Library. Each paper component was printed and painted on both sides, then hand-cut with a surgical scalpel along the edges of negative spaces to form surprisingly organic shapes. At points, paint is strewn across the paper spontaneously, covering some of the straight lines and geometry of the blueprints. 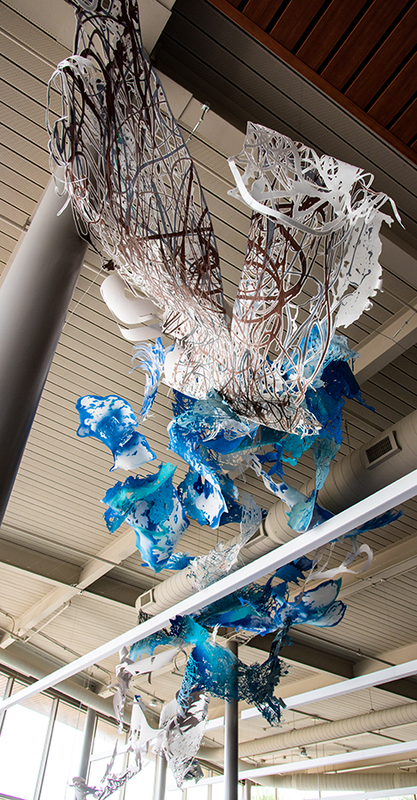 The free-form paper sculpture is an aesthetic juxtaposition of the Modernist sensibility of the surrounding architecture, creating a compelling visual experience overhead as visitors enter the library’s atrium. The piece is first seen through floor to ceiling glass windows from the outside and then encountered head-on as it leads the eye into the large, open space in a dramatic display of calligraphic marks and intricate cut lines. All while searching my eyes for help, an answer. Only are useful on the surface. Even as he denies her existence.